Hey Super Moms: Make Adorable DIY Valentines Cards With Your Kids! 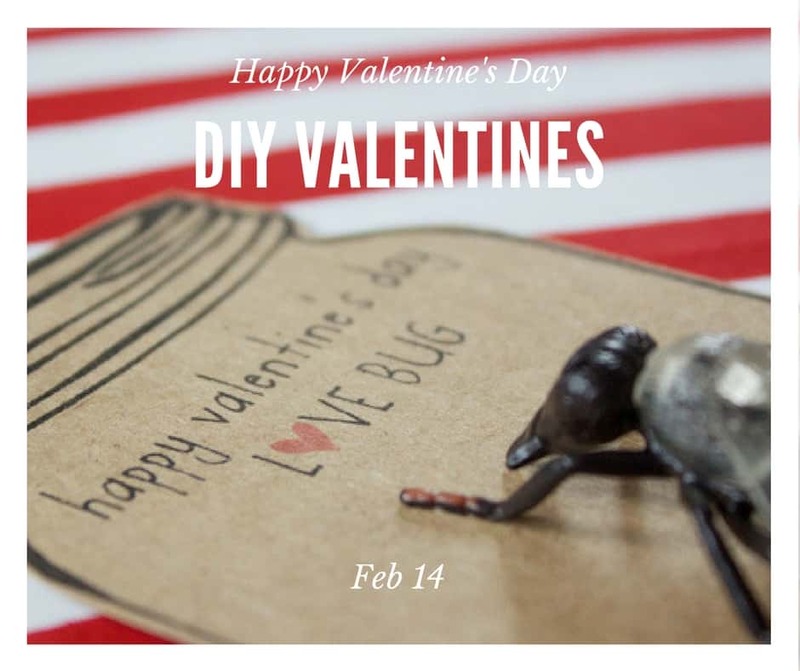 You are here: Home / Savings Tips / Hey Super Moms: Make Adorable DIY Valentines Cards With Your Kids! Today, we are sharing some super adorable ideas that would make great Valentines Day cards for school. Your children and their classmates will enjoy these fun little cards! Read on to learn about how to make these DIY Valentines cards with your little ones. 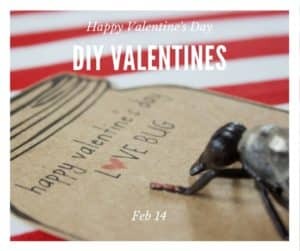 Bugs may give some people the creepy crawlies, but these bug Valentines shouldn’t scare anyone! 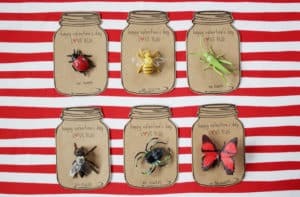 Any insect lover will certainly enjoy handing out these cute Valentines cards. Print and cut out your paper jars by using this template or by creating your own. Then, attach a bug to each jar using your double sided sticky tape. Your child can sign his or her name and write a special message to the classmates. For more information about this Love Bug Valentines Day cards for school idea, check out this website. 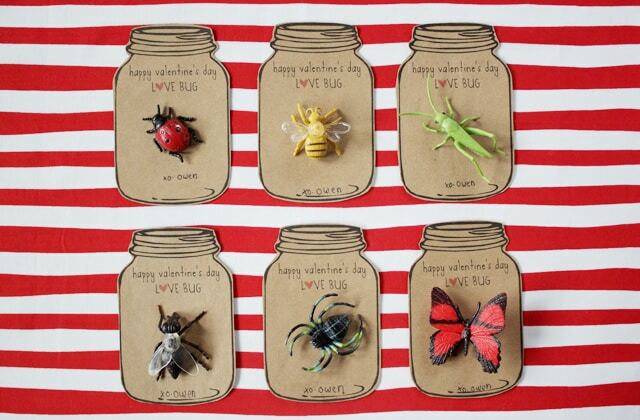 This bug card is also a great preschool Valentine ideas. Elementary school age children will go wild over these Glowing Hearts valentines! These Valentines literally glow after you snap the glow sticks they are attached to. These are extremely affordable, easy to make, and a huge hit with kids. You can create the actual Valentine message on your computer and print it out in heart shapes. The other option is to use a stencil to draw heart shapes on paper, write your messages inside the hearts, and cut them out. 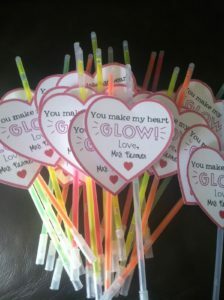 However, you make your heart messages, you will need to attach them to the glow sticks with tape. Be careful not to snap the glow sticks or they will begin to glow before the recipients receive them! To learn more about these glowing DIY Valentines cards, check out the source. These little army men Valentines are perfect for elementary school aged boys and girls! They are both crafty, easy to make, and so much fun. Write out or print out small messages for your Valentines. Some fitting messages include: Love is a battlefield!, You dropped the bomb on me!, and I can’t fight this feeling anymore. Then, punch a small hole in the upper left corner of your note. Use a thin ribbon or piece of string to tie it to the army men. 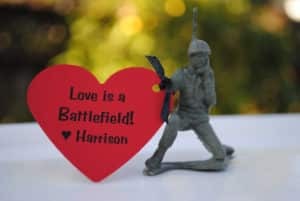 Learn more about these army men All is Fair valentines here. Not everyone is a big fan of Valentine’s Day! In fact, some people think that love flat out stinks. This Valentine idea is perfect for those people (probably young boys…) who think love is yucky! The great part about this Valentine is that it can be used over and over because it utilizes a real whoopee cushion! Print out or write out your ‘Love Stinks’ message on small squares of paper. Then, cut out the squares and use your hole punch to create a small hole in the upper left corner. Use your ribbon or string to attach the message to the bottom of the whoopee cushion (the part that you blow into to inflate the whoopee cushion). You can find more detailed directions for this project as well as information about the supplies used by following this link. Do you have some suggestions for simple and easy to make DIY Valentines? If so, feel free to share them with others in the comments section below. Have a happy Valentine’s Day next week!